The Red Sox will retire Johnny Pesky’s number on Friday night, putting his No. 6 on the upper deck facade alongside those of teammates Ted Williams (9) and Bobby Doerr (1). Pesky turns 89 on Saturday and still has a locker at Fenway Park. His number will be the sixth retired by Boston. Lucchino acknowledged the retirement of Pesky’s number was an exception to the longstanding criteria for such honor, which in the past has been bestowed upon players who had played at least 10 years with the Red Sox, finished their careers here, and were inducted into the Baseball Hall of Fame. Unlike Williams, Doerr, Carl Yastrzemski (No. 8), and Carlton Fisk (No. 27), Pesky is not in the Hall of Fame. Said Pesky: “When heard about it last night, I was told that the bosses wanted to see me and I thought I’d done something [wrong]. When I went to see what they wanted, and they told me, of course, I was flabbergasted. 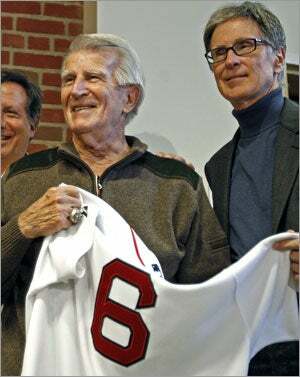 Pesky has been in some way connected to the Red Sox for 57 of his 69 years in baseball. Red Sox lore is incomplete without him. The right-field foul pole forever will be known as “Pesky’s Pole” — standing 302 feet from home plate, it was the only place, teammates used to joke, Pesky could hit a home run. He hit 17 in his career (only six in Fenway Park). Pesky played for the Red Sox in 1942, then again from 1946 until he was traded to the Tigers during the 1952 season. The shortstop missed the 1943-45 seasons because of World War II, during which he was enlisted in the Navy. Pesky batted .331 as a rookie in ’42, and finished with a .307 average in a career that ended in 1954. Pesky managed the Red Sox in 1963-64, and later served in a number of other roles, including as a coach and a broadcaster. He remains a consistent presence at Fenway as an unofficial ambassador. Several books have been written about Pesky, including David Halberstam’s “The Teammates“. Let us know in the comments section which former Sox you believe should be honored with a retired number. Chad Finn and Adam Kilgore of the Globe Staff, and the Associated Press contributed to this report.